How did Valentine’s Day begin? 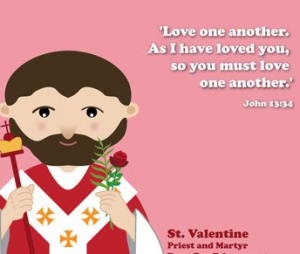 Valentine was a priest near Rome in about 270 AD. At that time the Roman Emperor Claudius felt that married men made poor soldiers so he abolished marriage. Valentine invited young lovers to come to him in secret where he joined them in marriage. When the emperor heard of this ‘friend of lovers’, he was impressed with his conviction and attempted to convert him to the Roman gods while Valentine attempted to convert the emperor to Christianity. When Valentine would not renounce Christianity, he was imprisoned. While in prison, he witnessed to the guards. One of the guards had adopted a blind girl and asked Valentine if his God could help the daughter see again. Valentine prayed and the girl was given her sight. The guard and his whole family believed in Jesus and were baptized. Valentine fell in love with the girl. When the emperor heard about Valentine making converts in prison, he was furious and had Valentine beheaded. Before Valentine died, he signed a farewell message to his love and signed it ‘from your Valentine’, a phrase that has lived long after its author died. Thus began the sending of Valentines. Because of Valentine’s dedication to the Lord, he was made a saint by the Catholic church. The church was seeking to usurp the popularity of the Roman god Lupercus. At the Lupercusian festival each year around the middle of February, a young man was assigned a woman companion for his ‘pleasure’ until the next year at the festival when he would get a different woman. The Catholic church was determined to put an end to this 800 year old immoral practice and Valentine seemed to be the ideal candidate to become a ‘lovers’ saint. 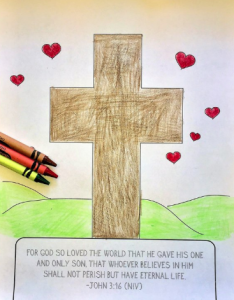 The ruler of Rome, Emperor Claudius, thought there were many gods, but a man named Valentine loved God with all his heart and told people that Jesus is the one true God. This made the Emperor Claudius very angry so he had Valentine put in jail. But even in jail, Valentine kept telling people about Jesus. The guard in the prison had a blind daughter and he asked Valentine if God could heal her. Valentine prayed for her and God caused her to see again. The guard and his whole family believed in Jesus after that and loved God with all their hearts. The emperor was so upset when he heard that Valentine was still telling people about Jesus, that he had him killed. 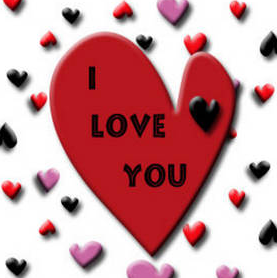 Before Valentine died on February 14, he sent a message to the jailer’s daughter whom he had fallen in love with. He signed the message ‘from your Valentine’ and this is where the sending of ‘Valentines’ began. Because Valentine loved Jesus so much, the Catholic church named him a ‘saint’ which is what someone is called that loves Jesus and cares about others. Each year we think about those we love and send them Valentines. Let’s remember that the first Valentine was sent by a man who loved God with all his heart. Download an audible copy of the story of St. Valentine here. 1 John 4:9 God showed how much he loved us by sending his only Son into this wicked world to bring to us eternal life through his death. 1 John 4:16b: God is love. 1 John 5:3: This is love for GOD: to obey his commands. John 15:12 This is My commandment, that you love one another as I have loved you. 1 John 4:11 Dear friends, since God loved us as much as that, we surely ought to love each other too. Make a giant heart out of red poster board (see above picture. Write Luke 10:27 or Matthew 22:37 “Love the Lord your God with all your heart” on the heart. Cut it into age-appropriate puzzle pieces. As you put each piece together say, “that’s not all my heart” until the puzzle is finished. Then read the verse and encourage the child to say, “God, I love you with all my heart”. If you have several children you can make two heart puzzles and race to see who can give God all their heart first. Before Valentine died on February 14th, he signed a farewell message to his love and signed it ‘from your Valentine’, a phrase that has lived long after its author died. Thus began the sending of Valentines. The emperor was so upset when he heard that Valentine was still telling people about Jesus, that he had him killed. Before Valentine died he sent a message to the jailer’s daughter whom he had fallen in love with. He signed the message ‘from your Valentine’ and this is where the sending of ‘Valentines’ began. Make a giant heart out of red poster board. Write Luke 10:27 or Matthew 22:37 “Love the Lord your God with all your heart” on the heart. Cut it into age-appropriate puzzle pieces. As you put each piece together say, “that’s not all my heart” until the puzzle is finished. Then read the verse and encourage the child to say, “God, I love you with all my heart”. 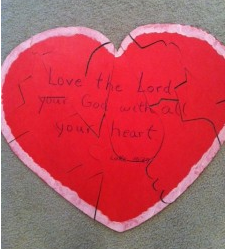 If you have several children you can make two heart puzzles and race to see who can give God all their heart first. How Shall We Order the Child? 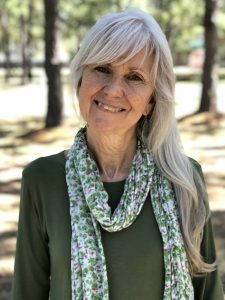 I am a mother, grandmother, pastor's wife, author, and blogger. © 2019 Sheilah Daws. All rights reserved.